BORN TO LOSE is an all-out punk-rock assault that combines beer-drenched vocals, sing-along choruses and high-voltage guitar licks to create fist-pumping anthems that make you remember why you fell in love with punk rock in the first place. They've been called everything from "Street Punk" to "Pub Rock", but one thing's for sure, no labels are gonna stop'em from serving up their own brand of Texas flavored punk rock. The guys had been kicking around Austin and cutting their teeth in other bands for a couple years before they all eventually found their way into Born To Lose in 2000. After a few years and many beers in and around Texas, they decided to take the circus on the road. 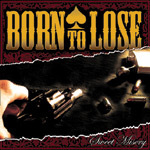 A couple records and thousands of miles later, Born To Lose is still at it, touring the good ol' U. S. of A. and eagerly anticipating the release of their new record Sweet Misery on Sailor's Grave Records on May 23, 2006.